As trainers we believe in leading by example, by working our own dogs and showing you that what works for us, can work for you too. Dean has been training and competing with his dogs for over 20 years in both obedience and working trials, both of which he has had great success in, even gaining the illustrious Working Trials Champion title with his Border Collie; ABI. Since 2012, Dean has been training his fourth dog: TEX, an Australian Kelpie, in similar fashion. Tex has now gained his TDex (tracking dog excellent) title, the first ever Kelpie to achieve this. Currently, Dean teaches puppy classes. 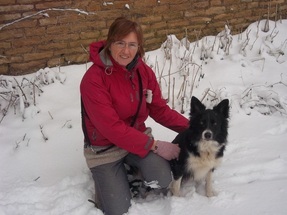 Hayley has worked with dogs all her life from boarding, breed and quarantine kennels and dog grooming parlours to helping take classes at her local dog training club. She mostly competes in obedience, but also enjoys working trials and, more recently, rally obedience. Right now she trains with her Border Collie STAR (who has also gained her TDex title and is also a TRICK CHAMPION) and has a young Collie BOOGIE who she enjoying training in RALLY, WORKING TRIALS, OBEDIENCE and AGILITY Hayley teaches the advanced training classes, as well as agility, Hoopers and Tricks. Daniel is another member of the Samdais team, and is currently growing as a trainer, competing in a variety of doggy sports alongside ABI. The two of them have been working together for over half a decade, and have competed in breed shows including Crufts, and have participated in the Samdais Demo Team.